Another PC game belonging to a series of bus simulators published over the years by astragon Entertainment. Developed by StillAlive, the game includes vehicles from such brands as MAN or Daimler Buses, and gives us an opportunity to explore one of the German towns. Bus Simulator 18 for PC is another installment in a series of bus simulators published over the years by astragon Entertainment. The player will be driving vehicles from such brands as MAN or Daimler Buses (the game has the required licenses), while exploring one of the German towns. 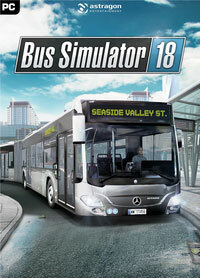 Bus Simulator 18 was developed by StillAlive – the creators of the previous installment released for PCs, as well as the studio behind Son of Nor among other titles. In Bus Simulator 18 for PC, the player not only has to arrive on time at different stops and observe the traffic rules, but they also have to interact with passengers (selling tickets for instance) and cope with various random occurrences, such as vehicle failures, traffic jams or weather changes. It is worth noticing that Bus Simulator 18 delivers a game world that’s more than twice as large than its predecessor’s (Bus Simulator 16), as well as a realistic day-night cycle. In the career mode, the player gains reputation points for doing a good job. The better of an employee the player is, the more passengers want to travel with them, which influences the financial results of the entire company – this gains the player access to newer buses. Also, the game offers a synchronous multiplayer mode. Bus Simulator 18 for PC utilizes the Unreal Engine 4, but in this particular case, one cannot expect much from the graphics. In similarity to other games of this type, the visuals are average-quality at best. Game score 8.5 / 10 calculated out of 96 players' votes. Expectations before the premiere: 7.9 / 10 calculated out of 89 players' votes.